While you have just welcomed your baby to the home, there are some important things that you may need to buy for his/her comfort. A baby stroller is one of the most important things which not only comforts the child but also helps you take a sigh of relief by allowing you to carry your kid around in the stroller. Modern baby strollers do multiple jobs and come in attractive colors to please your kid, while others may also have some toys for the child to play with. Below are some of the best baby strollers that you can consider buying for the newest and the youngest family member. Most parents these days use a stroller when they go for an outing or for a walk with their toddlers. If your baby is fussy, a stroller ride will also help him or her to fall asleep. Moreover, carrying your baby with ten shopping bags is next to impossible. Therefore, there arises a severe need for a baby stroller. How to make a stroller more safe and secure for your baby. 1) To prevent your baby from falling forward or tipping is advised to use the safety harness , which is included in most strollers below. 2) Make sure that you do not hang any dense material or a purse on the stroller handle as they can make the stroller unbalanced. 3) It is very important to set the brake of the stroller when it is not moving. 4) A regular check will make sure that your stroller is not having any sharp edges and is working correctly. 5) Don’t forget to read the manual before using the stroller. Below we have mentioned the top 10 baby strollers available online. To more about them in details, keep reading! 1) Safety of your child is of paramount importance to LuvLap and that’s the reason this stroller includes all the safety measures that you may ever need. 2) It has double wheels on all its four corners with the brakes included in the front and rear wheels. 3) A mosquito net is there to keep your child safe from bugs and the stroller has a 3-point safety harness too. 4) You can reverse the handlebar to move the stroller from the side of your choice and there is a netted looking window. 5) The bedding can be reclined in 3 positions to help keep the baby comfortable in any position. 6) A number of pockets have been placed at different places for your need. 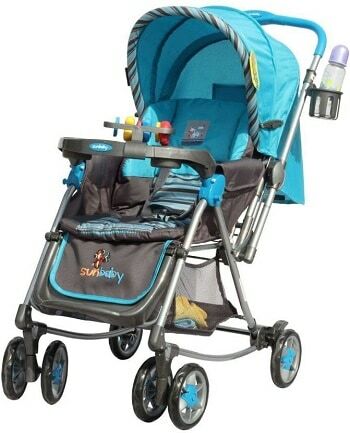 7) This stroller can be purchased in a wide variety of design and color options. 1) This rainbow series from R for Rabbit brings a colourful design to the pram to entice your child while being comfortable inside. 2) Standing true to its purpose, this stroller is easy to travel with its foldable design that makes its storage easier. 3) Sturdy metal has been used to make its frame so that you can completely rely on it for your child’s safety. 4) Its wheels have also been specially designed to give a smoother ride to your baby even on a bumpy road. 5) The safety harness on this baby stroller is joined from 5 points as an additional safety measure. 6) Plus, you can even recline it in the position you want your child to be in. 7) If rainbow is not what you are looking for, then you can grab one of these in a couple of more colour options. 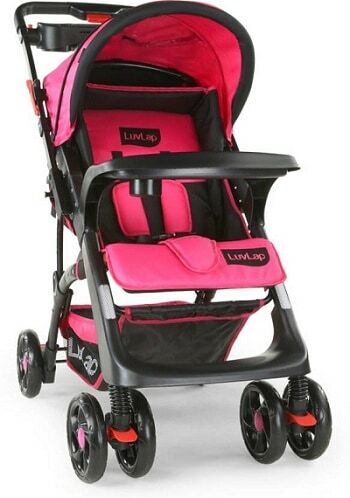 1) For a simpler looking baby stroller, LuvLap has this one to offer you. With this stroller, you will get ample space for the baby’s comfort while there are no additional pockets or bins that add extra weight. 2) It has an eight-wheel design for a better balance and it has breaks for your child’s safety when on a sloppy surface. 3) LuvLap has included a 5-point safety harness along with a double canopy design to keep the harsh sun away. 4) There is a pocket on the back to store small items and a window for keeping an eye on the baby. 5) The stroller is foldable making it easier to carry. 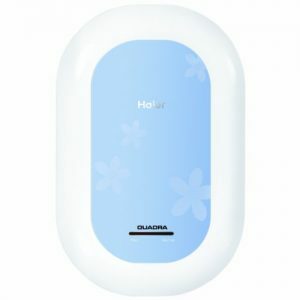 6) You can grab this product in any of the available five colours. 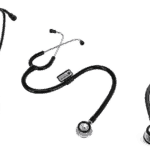 1) With a tighter budget, BAYBEE could offer you a great product from its portfolio. 2) Your child’s safety and comfort are the top priority here and that’s the reason the company has included a 3-point safety harness that is paired with a safety belt for an all-round protection. 3) The backrest of the stroller can be reclined by up to three positions. 4) Both the rear wheels have a break for when you’d need to apply them and there is a footrest on the front beam. 5) The stroller handle is covered with soft foam for you to have a comfortable hold for extended duration. 6) A shopping basket has also been included below the stroller in case you need it. 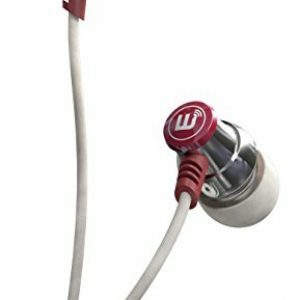 7) The company offers you a wide selection of colors to choose from. 1) This baby stroller from Toyhouse is all cushioned up offering a very comfortable ride to your child when you will take him/her out. 2) Its backrest and footrest can be reclined to the lying position when your baby is asleep. 3) There is a food tray on the front as well which can be removed when not in use. 4) Even the safety belt of this stroller is padded for extra comfort and the shock absorbing front wheels can swivel while the ones at the back have an easy to apply brake system. 5) You can adjust the canopy as per the need and there is a cup holder near the handlebar for you to keep your cup of coffee. 6) There is a fairly large basket at the bottom and the stroller can be folded for carrying. 1) To ensure an all-round safety and comfort of your child, this baby stroller features a list of features. 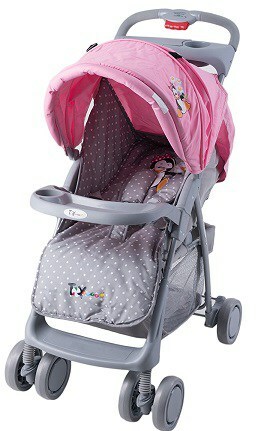 2) The rocking function has also been included in this stroller along with the usual functions. 3) It has a fairly large foldable canopy to keep your child safe from sunshine and a mosquito net has also been included for additional safety against bugs. 4) Food tray comes included on the front which includes some rattles too and it is paired with an adjustable footrest. 5) The handle is reversible, and you can find a storage basket at the bottom. 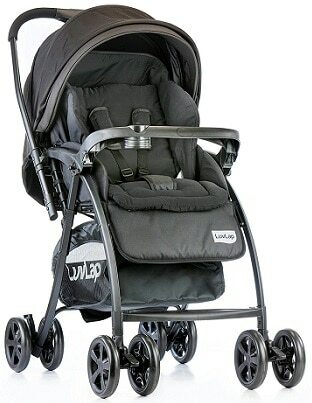 6) The back cushion can be reclined as per the need while the entire stroller can be folded into a small package. 7) There is a 3-point safety harness its rear wheels include brakes for ensuring safety. 1) Ensuring absolute comfort and ease of travelling, Tiffy & Toffee has made one of the best baby strollers in this list. 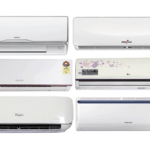 2) It is an allrounder product that includes all the features that you can ask from such a product. 3) Safety features include a 3-point harness, brakes on the rear wheels, lockable front wheels, mosquito net, and much more. 4) It has eight wheels with two in each corner for a better balance and some musical toys come included with the stroller for keeping the child busy. 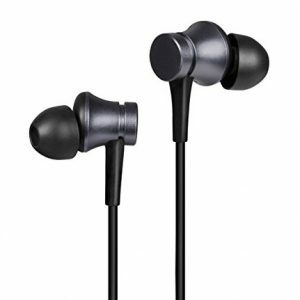 5) The company has ensured proper cushioning from all the sides and has included a number of pockets for you to store some important stuff. 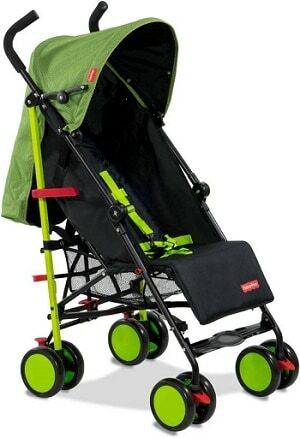 6) While the stroller can be reclined, you can get it in one of the many colour options. 1) In case you are looking for a premium product, the LuvLap has got one baby stroller for you. 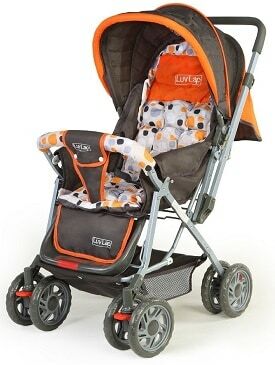 2) For optimum safety and peace of mind, while the stroller is steady, all the four sets of wheels include brakes. 3) It has a reversible handle which you can swing according to your need and it also has a cup holder. 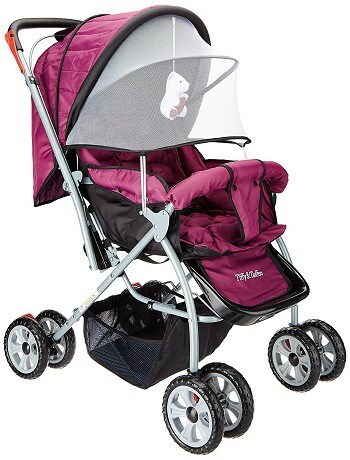 4) On the front, there is a food tray and the stroller has a large foldable canopy to keep your child safe from nature. 5) The safety harness has 5 contact points ensuring further safety and you can fold the baby stroller using just one hand. 6) There is a looking window on the back and extra pockets have been provided at multiple places. 1) As the name suggests, this is a grand baby stroller with all the features and amenities that you can ask for. 2) The seat on this stroller is as comfortable as you can imagine with a lot of padding and cushioning. 3) For the child’s safety, there is a 3-point harness, which again is padded for comfort. A pair of wheels is present in each corner with brakes on all of them. 4) A large canopy has been included along with a food tray and an adjustable footrest. 5) Like any other baby stroller, you can adjust the seat for up to three positions and the handle can also be moved around as per your convenience. 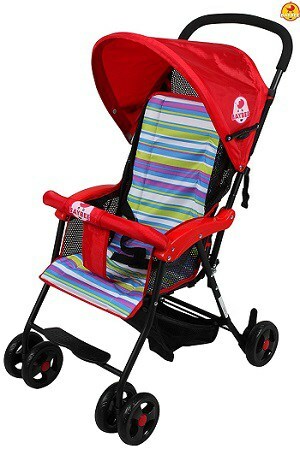 6) This stroller is available in a bunch of bright colors. 1) This fully adjustable baby stroller is suitable for kids up to 3 years where you can carry them around while they’re sitting inside comfortably. 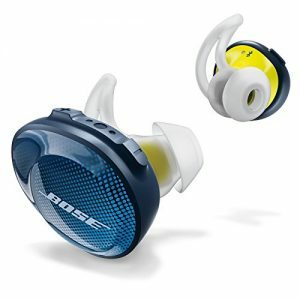 2) It can take up to 15kg of weight and is completely foldable for easily travelling with it. 3) For the base material of the frame, steel has been used to provide the required strength. 4) Moving on an uneven surface is made easy with the included suspension in the front wheels and it has a 5-point safety harness. 5) Backrest and the footrest can be easily adjusted, so can the canopy that is wide enough to save your baby from harmful rays. 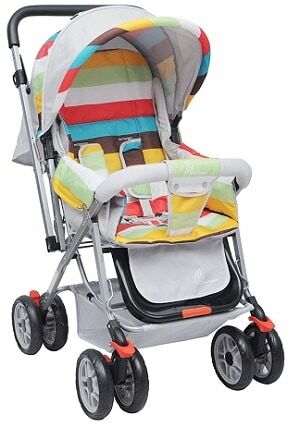 6) The stroller comes with a lot of pockets here and there to keep your and the baby’s stuff safely. Before you even decide to purchase a stroller it is better to do a proper research regarding the price. It is also advised to purchase a stroller within your budget as one might easily get overwhelmed by the number of choices available. Decide whether you want the stroller for just strolling your baby in a local park or if you’re going to carry it along with you when you travel with the baby. While purchasing a stroller it is very important to know the amount of weight it can carry. Not all strollers can carry the same amount of weight. If both parents use the stroller on a regular basis, it is better to go for a stroller that has an adjustable handle. A stroller having an adjustable handle can be very easily used by both parents. It helps in solving problems that may arise due to differences in height. Another thing to keep in mind when purchasing a baby stroller is to identify how secure it is. Since the stroller is used for carrying your baby, it is highly advised to go for the one that is well built and of top notch quality. 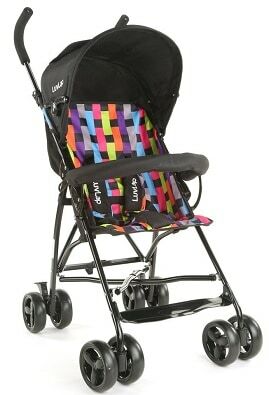 Below are some of the popular strollers available online as well as offline. These strollers come with a frame. For instance, they have a handle, storage basket and smooth wheels. If you attach a compatible car seat for the infant, it becomes complete. These are super lightweight and can be easily folded. You would definitely not wish to disturb your baby when he/she is sleeping. 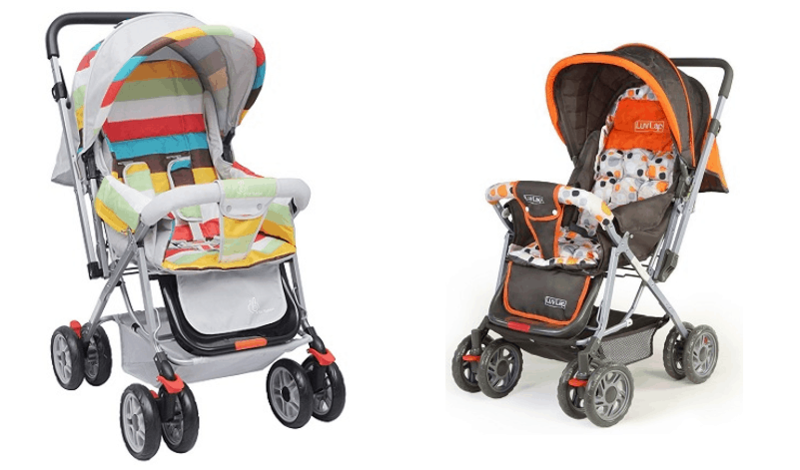 These travel strollers are perfect for your babies while travelling. They come with an attachable car seat making it perfect for your baby without disturbing their sleep. Also, these strollers come with a detachable car seat. 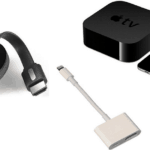 You can thus save your money. These strollers are very lightweight and inexpensive. However, they are not perfect for infants. These are ideal for babies who can sit without any support since these strollers do not come with any support or cushion. 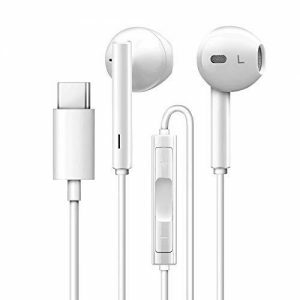 Since they are very cheap, many parents purchase them and use them as a second option while travelling. However, they are a great alternative to umbrella stroller or the travel stroller as they can be folded and carried comfortably in an airplane. When is the perfect time for using a stroller? A stroller is perfect for parents who often travel from one place to another or take their babies out frequently. A stroller helps to carry the baby very easily. You can use a stroller until your baby weight above 50 pounds. Park walks , local store visits become a delight with a baby stroller.